The 8-acre Brickyard development is bordered by Catoctin Circle on the west and the Leesburg Police Department on the east. Plans for another mixed-use community in Leesburg’s Crescent Design District advanced Thursday night. 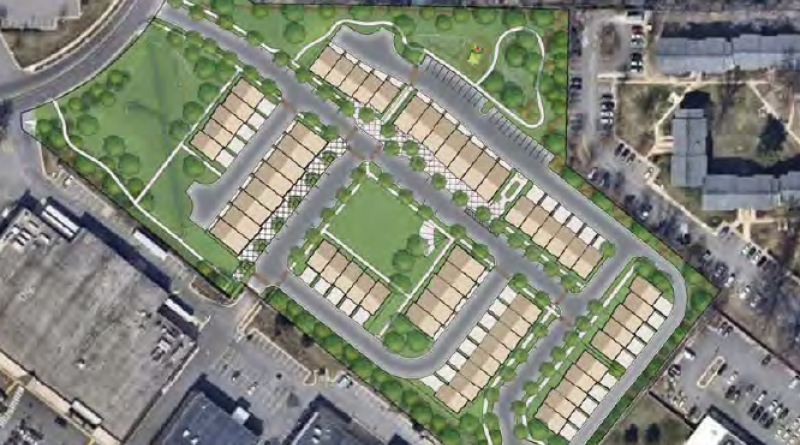 The Planning Commission endorsed Andre Inc.’s 59-townhouse project, called the Brickyard. Located on 8 acres behind the Leesburg Plaza Shopping east of Catoctin Circle, the project includes 20 “live/work” units that have office space on the ground floor. Developer Brad Durga said he has been working on the project for three years and was pleased to have addressed the concerns of town planners, who are recommending approval of the rezoning. While commissioners were supportive of the project overall, they were divided on whether to send it to the Town Council or hold work session to discuss it. A vote to recommend approval failed on a 3-3 vote, with Chairwoman Lyndsay Welsh Chamblin, Ad Barnes and Doris Kidder opposed. The trio advocated another work session after three Edwards Ferry residents asked questions about changes made to the application after they last met with the developer. Durga said that none of the changes affected those adjoining lots, but only dealt with issues in the interior of the property. Commissioners Sharon Babbin, Rick Lanham and JoAnn Walker said the application met the town’s standards for approval and that holding it for another meeting would be an unnecessary delay for the developer. Ultimately, Chamblin agreed to support the application, while encouraging Druga to meet again with the neighbors. The second motion to recommend approval passed on a 4-2 vote. The Town Council is expected to take up the application in December.